Thank you for accessing www.glengoyne.com, part of Ian Macleod Distillers Limited. These Terms and Conditions shall apply to You (the user) whilst accessing the Glengoyne website (the ‘Site’) and its related channels. This Site is operated for the purpose of promoting alcoholic beverages. 1) Of legal age for purchasing and consuming alcoholic beverages in accordance with the regulations of your country of residence. 2) In a country which permits the promotion and consumption of alcoholic beverages. 3) aware of how to consume alcohol responsibly. If You do not wish to be bound by the terms and conditions detailed, You should not use the Ian Macleod Distillers Limited Site. 1) You may not in any way, shape or form act on behalf of Ian Macleod Distillers Limited or affiliated groups/ individuals. 2) You will not copy, download, reproduce, republish, frame, broadcast, transmit in any manner whatsoever, any material on the Site except as is strictly necessary for your own personal, non-commercial, home use unless otherwise agreed in writing with Ian Macleod Distillers Limited. 3) You will not express opinions on the Site or related channels that are crude, racist, sexist, vulgar or otherwise offensive. 4) When participating in competitions or promotions from the Site or related channels you will ensure to abide by any specific rules set. 5) You will refrain from infringing or disrupting the Site from functioning, exposing it to viruses or spams, breaching security or conducting any illegal activity which is likely to violate the rights of Ian Macleod Distillers Limited. 6)You will refrain from sending content from the Site to persons under the legal alcohol consumption/purchasing age. Users should access the Ian Macleod Distillers Limited Site at their own risk. Whilst we aim to ensure that the content on the Site is correct Ian Macleod Distillers Limited cannot give any warranty as to the accuracy or completeness of the Site. Nor can Ian Macleod Distillers Limited guarantee that the Site will operate error-free, uninterrupted or free from any so-called computer viruses. The Site and its content are provided ‘as is’. Ian Macleod Distillers Limited do not accept responsibility for any loss or damage You may encounter as a consequence of placing trust in the information found on the Site. Appropriate research should be taken by the user before placing reliance upon the content found on the Site. Any reliance placed on information found on the Site should be done at the users own risk. Ian Macleod Distillers Limited have no control of, accept no responsibility for and do not endorse any content found within third party sites which may be linked to the Ian Macleod Distillers Limited Site. Links to these sites are to ease access for the user. Any reliance placed on information found on third party sites should be done at the users own risk. 1) By entering our competitions, you confirm that you are of legal drinking age in your country of residence. 2) Employees of the Promoter, their families and anyone professionally involved with these competitions are excluded from participating. 3) You may only enter once. 4) The competition will terminate at midnight (GMT) on the date set unless otherwise specified. There will be no cash or other alternative to the prize offered and the prizes are not transferable. Dependent on the competition, prizes may only be shipped to selected countries. If the prize is tour based, travel and accommodation expenses are not included in the offering. Winners will be chosen at random by an independent adjudicator. The winners will be notified via email after each competition has ended. The judges’ decision is final. No correspondence will be entered into. 1) The data and/or files submitted along with each entry will be retained for the purposes of administering this competition. 2) The entrant consents to the Promoter's use and processing of the entrant's personal data/files in connection with the competition. 3) The Promoter may use such details to let the entrant know about other products, services and promotions which they think may be of interest to the entrant. 4) Participants consent to their submitted data/files being used for Marketing purposes by the Promoter but may opt out at any time by emailing info@ianmacleod.com. 5) If uploading a photo as part of a competition, the participant agrees to Ian Macleod Distillers (or one of their brands) making use of this photograph within online promotional channels such as websites and social media pages. 6) Participants may opt out of receiving further emails from Ian Macleod Distillers Ltd, any of their brands or from 3rd parties and may request their details be removed from the database by emailing info@ianmacleod.com. 1) Customers may only redeem offer codes for one transaction. 2) Offer codes may not be used in conjunction with any other offer. 3) All offers are inclusive of VAT and exclusive of shipping charges. "Notre philosophie. La Philosophie Glengoyne. 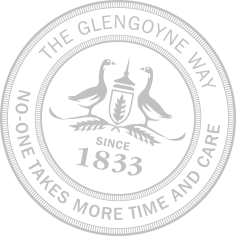 Personne ne prend autant de temps et de soin "
La distillerie Glengoyne encourage la consommation responsable en relation avec les règles du SWA. Veuillez renseigner votre âge et votre pays de résidence au moment de l’achat.